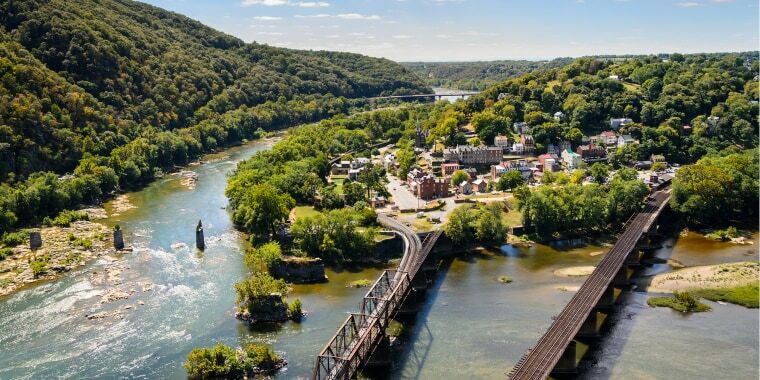 Surrounded by water on three sides, the town of Harpers Ferry, famous for being the site of John Brown's 1859 abolitionist raid, sits at the gorgeously dramatic meeting point of the Potomac and Shenandoah rivers. The historic downtown area, which is filled with restored 19th-century buildings, feels like a film set. It sits within the boundaries of Harpers Ferry National Historical Park and because parking is so limited, most people leave their cars at the Visitors' Center and take the free shuttle if they aren't hiking or taking the train. Visitors to John Brown's Fort, a red brick building that was once a firehouse, will learn not only about the famous raid but also the structure's fascinating history: It has been taken apart and re-assembled several times, standing in five locations total (four in Harpers Ferry and one in Chicago). From The Point, a scenic area at the end of Shenandoah Street, travelers can not only see where the two rivers meet, but also overlook three states at once: Maryland, Virginia and West Virginia. Need an adrenaline rush to balance all that history? Harpers Ferry Adventure Center offers flatwater tubing on the Shenandoah (great for younger kids), whitewater rafting on the Potomac, zip lining and rope climbing. Many of the smaller, historical inns don't allow children under age 12, but they're welcomed at The Town's Inn, which is set in a pair of 19th-century guesthouses on High Street. There are just a handful of rooms, and not all have multiple beds, so it's worth booking early. The Clarion Inn Harpers Ferry is slightly outside downtown, but within walking distance of an aerial adventure park. If your kids are planning to take a dip, ask for one of the poolside rooms; you enter them from a balcony overlooking the swimming area. The burgers, wraps and sandwiches at the Potomac Grille are basic and dependable—it's the expansive deck that's the real star of the show. Dotted with bright orange umbrellas, it overlooks the river and railroad station, so you can pass the time watching the freight, Amtrak and commuter trains roll through. True Treats Historic Candy calls itself "the nation’s only research-based historic candy store" and sells sweets made using old-time methods that date as far back as 1591. Colonial chocolate sticks, 19th-century aphrodisiac truffles and Prohibition-era toffees are just a few of the treats you can scoop up, along with more modern sugary interpretations like Pop Rocks and Fireballs.